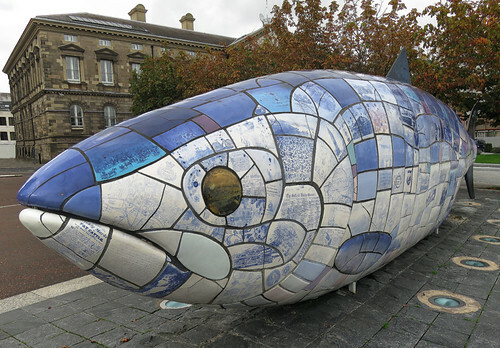 The ‘Big Fish’ is a sculpture across the water from Belfast’s Maritime Trail. It was listed as a point of interest in Belfast but from a distance I wasn’t super-impressed. 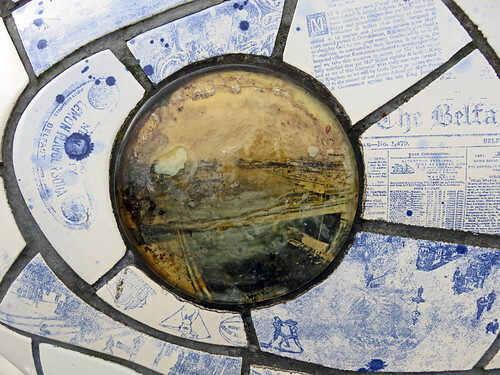 It wasn’t until I got up close and realized that the mosaic tiles were full of details from old newspapers, paintings and documents containing the history of Belfast. When I peered deeply into the eye of Belfast’s ‘Big Fish’ I saw that it contained a view of the harbour the way it once was. Somewhere there must be a ‘map’ telling the story behind each of these tiles but I couldn’t find one. 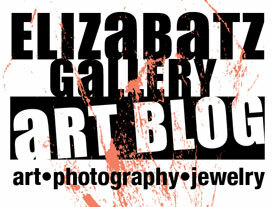 More of the Daily Post’s Weekly Photo Challenge: Details. I passed this one for many years .. really amazing when looking closer on it. All the different tiles .. and pictures. Happy entry for me. Thanks. Miss Belfast. Yes, I stopped many times to read them … always some new to read. What an amazing sculpture! one can spend days over all the details. Wonderful contribution to the topic and really to the point! 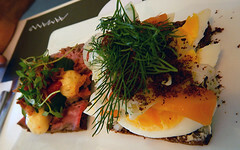 The idea with the fish is also interesting, by the way. That’s really neat. I must have missed that while I was there last.